Sometimes people are born in life with everything they need, and sometimes people are born with nothing at all. For today's February fashion and teen winter fashion individual, Josue, life wasn't always filled with joy and riches. It was a struggle for his parents growing up. Yet, young kids don't really understand that struggle all too well until they get older. For today, Josue reflects on the parents he's grateful for who couldn't give him everything he wanted but made ends meet in hard times. He also speaks about a Youtuber, Timothy Delaghetto, who shares both a similar childhood and a love of shoes with him. Both their families also didn't always have it easy but have since risen to the idea of the American dream. Timothy Delaghetto is a famous YouTuber and rapper born to two Thai immigrants. Josue remembers seeing one of his Instagram posts where he was out with his parents travelling in Thailand. Tim stopped by the mall and saw a pair of Adidas he wanted, but just as he was about to pay, his father offered to do it for him. Timothy's dad told his son, "It's okay. I want to make up for all those years I had to tell you no because we didn't have the money to get the shoes you wanted." It almost drove Timothy to tears, and it did for Josue to read that. Josue's always been a sneaker head, but just like Tim, his parents were immigrants and weren't always able to purchase such expensive shoes. Growing up, Josue admits that he wanted too much and complained when he didn't get what he wanted. Almost everyone growing up was the same way. As the years rolled on and Josue looked back at it, he realized that it was a difficult period for his parents who had to work night and day to keep Josue and sisters on their feet and getting an education. They may not have been able to give Josue the sneakers he wanted, but his parents put food on the table. He's promised that one day, for all the hassle his parents went through to raise three kids, he's going to pay them back someway and somehow. Josue's thankful for all the sacrifices and all the little things his parents did to get by. 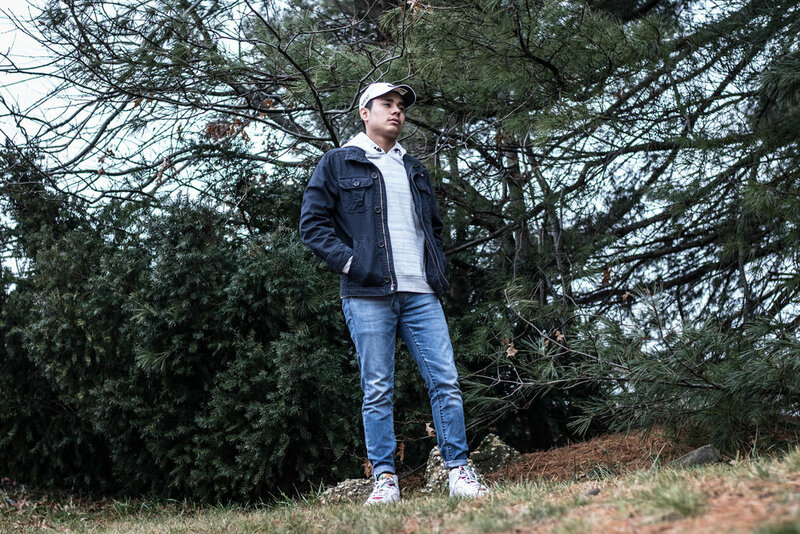 Coming back with his men's urban street style, Josue is presenting another solid men's fashion look for February. Beginning at the base, he's rocking a pair of Jordan Retro 7 sneakers with pops of red, orange, and green down the center. Next, Josue has on some classic denim jeans that never fail to work with anything. For his look, he's also got on a men's navy blue jacket with a men's white pullover hoodie underneath that matches his shoes. Finally, to top if off, Josue's wearing a white Nike hat. He's definitely adding to our series of street fashion and is providing, as always, some stellar inspiration for the season.